Testimonials help current and potential patients understand the wide breadth of conditions we treat and get a feel for what the experience of being treated by Dr. Erickson is like. Please feel free to submit a testimonial on your experience as a patient of Dr. Erickson to the following email address: frontdesk@ericksonhealingarts.com. I am very happy I came in to meet you. I could feel your passion for the work you are doing and you zeroed in on my needs very quickly – Zane was very welcoming as well. Seeing Dr. Erickson was a pleasure. I felt I was in truly skilled hands and her holistic approach to how issues were connected was reassuring. I felt taller, pain free and more fluid in my body after the session. I highly recommend her. Very professional, very knowledgeable, very relaxing. An overall terrific experience. Thank you for waiting for me as I was stuck in a very bad traffic jam, which shortened my appointment. And thank you for quickly assessing my needs as a first-time patient after I arrived so late. You have what it takes to heal. I am delighted to have found such a caring and competent chiropractor. I feel sure that my health will improve through this fortunate association. Amazing first visit! And am so confident my lower back issues will be fixed. 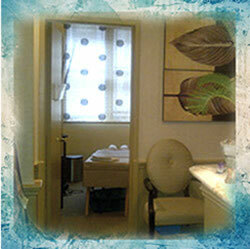 I felt heard, I enjoyed the thorough explanations and customized treatment. One of the best chiropractic sessions I’ve ever had (and it was just my first!). I want you to know how much you helped me on Saturday. I don’t want to be too overly dramatic but I feel like you literally saved my life. I was so miserable when I walked in and I walked out feeling so much better. I can’t thank you enough. Karen Erickson is a master at her practice. She is clearly deeply observant and knowledgeable regarding the human body. I walked into her practice in deep pain, on the recommendation of a friend. She gently but clearly guided me through her work. She has a rare dual quality of being both cleanly professional and sensitively present. There is a touch of magic within her very adept skills. The staff and office are kindly welcoming. Thank you! Several of my family members have been seen by Dr. Erickson for various concerns, and highly recommended the practice to me for my back pain. When I told them I had an appointment, I could tell that they almost wished they could come too for help with their pains! I found the practice professional, educational, and relaxing. I feel great from both the adjustment and the infrared sauna. I look forward to running strong & healthy going forward! I came to Dr. Erickson seeking help with some lower back pain. Not only did she help me identify the problem, she also helped adjust my body/posture and provided me with some useful exercises to do on my own. I didn’t expect her physical treatment to have an immediately noticeable effect on my mood, but I found that I left the office in much higher spirits than when I had first arrived. Thank you, Dr. Erickson! I’ve seen various chiros and accupuncurists for this nerve compression over the past 3 weeks and can honestly say, Today is the first time am experiencing noticeable relief with extended periods of low grade pain. What a difference!! I now have confidence this condition can be fully healed in the near term. This is such a unique blend of homeopathic healing and chiropractics. Dr. Erickson was knowledgeable and genuinely concerned for my back condition. I’ll definitly be coming back! You have been my chiropractor since 1996. I can’t thank you enough for your incredible gifts as a healer. No one could literally keep my head screwed on right but you. Yesterday was an astounding session and I am so grateful for the relief you gave, trying to achieve the exact adjustment that got my poor crooked neck back in alignment. I just thought you’d like to know your impact. Thanks again! Dr. Erickson is a life saver. Explained the source of my pain and what happened in a clear and understandable fashion. Not only treated my injury but gave me tangible tips on how to sit, stand and work to avoid future injury. I absolutely adored my experience. Dr. Erickson is a true healer – intuitive and brilliant. She most definitely will be part of my healing team! Thank You. You helped me immeasurably. You’re magical and a genius. I am very grateful for Dr. Erickson’s knowledge and the treatment I have received. She explained the procedures she did and what a lower back x-ray was showing–making clear to me for the first time–after many visits elsewhere–why I have the pain I do–and how it can be treated. Dr. Erickson has the healing touch and through her listening skills and magical hands, she understands exactly what your body needs in order to heal. My apprehension to have anyone touch my neck after a difficult and traumatic neck injury quickly dissipated after spending one session with Dr. Erickson. She was hopeful and respectful of my situation and I could not be in better hands. Thank you! Dr. Erickson was amazing! I was in so much pain and she knew just how to handle it. I’m looking forward to continued care with her. In addition to her expertise, her assistant was more than polite and helpful and the office was clean and inviting. I had to bring my 3 small children with me and the office was also very accommodating and sweet to them as well. Thank you again! Very relieved to finally have met someone who can offer relief from my migraines. Dr. Erickson is extremely knowledgeable but also very comforting. I walked out of the office feeling so much better than I did on the way in and we’ve only just started! Thank you! Dr. Karen Erickson is a nothing short of a miracle-worker! when my son was 8 months old, his shoulder, elbow and wrist were dislocated. Three different doctors said that it was easy “fix”, yet none of them had the skill to do so. When Dr. Erickson saw him, she completely healed the problem in a matter of minutes. Dr. Erickson’s level of experience, skill and lovely manner are unmatched. If you’re interested in seeing the very best in NYC, there’s no other chiropractor to consider! I came to Dr. Erickson desperate for relief from pain and immobility from a car accident. Dr. Erickson was the first doctor to look at my overall body, taking care of all my issues. She was very caring but also very professional and took the time to listen to my needs, give helpful advice and fully inform me on what to expect or why something was helpful to do. The lovely front desk folks are very welcoming and helpful with insurance issues. I’m very grateful to everyone in the office for their kindness. Thank you. You helped me immeasurably. I could actually stand up this morning. You’re magical and a genius. I just had a visit to one of the top professionals in her field. I feel that the issues and questions I came in with were addressed and finally feel like there is someone to help my child. I feel relieved and hopeful. I am over the moon after seeing Dr. Erickson today for the first time. I feel so much better. The pain in my sacrum has decreased significantly and my body feels looser and more energized. I am relieved to have found Dr. Erickson and look forward to my next appointment. I also really like the office setting it is very tranquil and welcoming. This was my first time seeing a chiropractor and I must say – I was very impressed with Dr. Erickson’s assessment and treatment. She knew how to put my back together in just a few minutes! She understands my issues and I am just delighted to have found her. I have had the privilege of working with Dr. Karen Erickson for over 12 years. I came to her with serious chronic conditions: a near-fatal car accident, neck pain and headaches, post-polio syndrome and many other serious health issues. Dr. Erickson has been able give me relief with her vast knowledge and healing hands, where many medical doctors have failed. She never treats me as a set of symptoms, but as an entire individual. I am forever grateful to her. Dr. Karen Erickson is a phenomenal healer, with an expansive holistic approach. She listens deeply, and has the most compassionate hands. Her work is profound. I have been her patient for well over a decade, and she has assisted me with everything from tennis elbow to kidney stones and low back/neck issues. I love her knowledge about supplements and essential oils. I admire her skills in adjusting. Dr. Erickson’s cranial sacral technique will leave you with a remarkable before and after affect. I always leave feeling way better than when I entered her treatment room. I do not have a doubt that Dr. Karen Erickson is the BEST CHIROPRACTOR in New York City. I came to Karen after having tried physical therapy, massage, and other healing work for relief for my lower back and knee pain from the stresses created by my job. What amazed me is that Dr. Erickson not only addressed the physical aspects of the problem, she also provided relaxation tools and allowed my body to be at a state of ease. She truly makes the session a relaxing one, using essential oils to enhance the healing experience. Her gentle hands and her careful work produce a state of calm for me that I carry out with me as I leave the session, and face the day. Dr. Erickson is also a teacher. She thoroughly educates you about your body and takes time to understand your concerns and needs. I encourage anyone who seeks a true healing experience to see Karen – even if just once. She is a miracle worker! When it comes to receiving the best chiropractic care, I go to Dr. Karen Erickson. I am a nurse with a diagnosis of Pulmonary Fibrosis related to September 11, 2001. I use an oxygen tank at all times. Before receiving chiropractic care from Dr Erickson, severe coughing episodes had put a great deal of stress on my respiratory system, leading me to increase my oxygen consumption from 2 liter to 4 liters per minute. Through her vast knowledge and chiropractic skills, Karen Erickson, DC has improved my neurological and musculoskeletal function, improving lymphatic drainage and respiratory function. Her work has caused my coughing episodes, sinus congestion and secretion production to dramatically decrease, making it easier for me to take deep breaths. This has allowed me to go back to 2 liters of oxygen per minute. I appreciate the depth of knowledge, experience, confidence and passion that Karen Erickson, DC has shown me. I would highly recommend for anyone who has any respiratory problems to make an appointment to see this wonderful health care provider. I have not had a pain-free minute in two years and 10 months (forced to spend most of my time in bed since my condition was so painful) – that is, until I met Dr. Erickson. In my first session with Dr. Erickson my condition improved 65% and in my second I improved to 75%. I am still working with Dr. Erickson to get total relief but for the first time in 2 years and 10 months, I have had some real relief and of course with that comes real hope. Dr. Erickson is a miracle maker. Thank you again for all, Sally. I consider my healing journey with Dr. Erickson as being somewhat miraculous. When first referred to Dr. Erickson over 12 years ago, I could hardly walk at times. Severe chronic pain and intermittent bouts of being knocked off my feet, for days or weeks, were too familiar. I’d come very close to succumbing to a surgical procedure. Dr. Erickson’s approach is calm and methodical. The depth to which she applies her knowledge and a variety of soothing applications, both physically and energetically, is unusual and difficult to describe. She takes a great deal of time in each session, typically leaving me feeling “like butter” when finished. She guides patients through simple, at home routines further contributing to comfort and healing. Unlike chiropractors and practitioners, the effects of Dr. Erickson’s work and advice last for a very long time. Today I need a little body work to feel “pain free”. I now seek Dr. Erickson’s healing hands, and heart, for overall maintenance and relief for that occasional “catch” I can’t work out on my own. Sessions with Dr. Erickson continue to be well worth my time and investment. I sincerely recommend others to seek her help. I have been a patient of Dr. Erickson’s since the beginning of her career. I am the kind of person who, if she doesn’t find the help she requires thanks the person and never returns. Personally, my body, heart, and mind health would be in terrible shape without Dr. Erickson’s exceptional healing powers. She is truly one of the most remarkable healers I’ve ever met, and I bless her! A friend referred me to Dr. Erickson when I complained about the pain from my TMJ. A chiropractor for TMJ? You bet! I’d have never known what a chiropractor can do for my jaw or the rest of my body had I not trusted my friend’s recommendation. Now, nearly 10 years later, I’m still a patient of Dr. Erickson. My TMJ, while sometimes still “achy,” is managed without medication or any type of surgery thanks to her healing hands! After every visit, I leave with my neck a little longer, my posture a little better and a calmness I describe as “feeling like a marshmallow.” Put any trepidation about chiropractors you have to the wayside. Your body and spirit will be well rewarded with the relief Dr. Erickson can provide. When I first came to Karen, I was suffering from daily chronic pain and fibromyalgia, which were the result of a bad accident. Thanks to Karen’s incredible care and expertise, I am now living a pain-free life. Karen is not only an excellent chiropractor – she is a true healer, with a very lovely and generous spirit. I highly recommend her! Karen is a true healer. My kids, including my 7 year old son with asthma, have benefited from her healing touch many times. She is our go-to healer, especially for preventative care during the flu season when we need it. In my fantasy world I would start every day with a visit Dr. Erickson. When I leave her office I feel healthier, stronger, and more aware of my body. One of the things I love most about seeing her ( besides how great I feel afterwards!) is that she consistently helps me to release painful holdings. She does this not only through traditional chiropractic methods but also through her extensive background in so many of the healing arts, like the use of essential oils, cranio-sacral therapy and very specific deep-tissue muscle work. At each visit I am more and more impressed with her rich understanding of human physiology and by the healing touch of her hands. She shares her wisdom and skills with such caring and sensitivity that I feel her support is effective on both a physical and a soul level. The work she does with my body and the suggestions she makes during our sessions, reverberate in my life throughout the week. She has not only helped me but has been an amazing resource for our whole family. Dr. Erickson helped us discover food sensitivities that our daughter has and works gently with her to support her body in ways that have helped to bring out her spirit, and changed her whole energetic being. I’m very grateful to have found Dr. Erickson! This is a long overdue testimonial to dear Dr. Karen Erickson. What better way to look towards my New Year than to recognize and give thanks to those that made a difference in my life this year. Dr. Erickson, you have made a huge difference. I have known Dr. Erickson for roughly two years and have been referred to her to help me with a tired back and neck. I never anticipated I would get the emotional and mental care coupled with physical in a visit to the ” chiropractor.” What I received was so much more than I could have imagined. Dr. Erickson has gifted hands for sure and a method for healing that unmatched. But what else she possesses is way beyond all of that. She is mindful, she is tender, she is kind-hearted, she is a healer, she is available, she is supportive and gives love from her heart. I wish I could have the opportunity to having her healing hands and powerful spirit around me everyday. Dr. Erickson, I thank you from the bottom of my soul. You are an incredible gift in my life. I cherish the times I can see Dr. Erickson. She helps so much for various symptoms. After my car accident, I could barely move and had wicked headaches. After five sessions, I had a lightness and the ability to move and take care of my family. We bring the whole family! She is a vital part of our family’s health–mental and physical. Dr. Karen Erickson is an amazing healer. I have been seeing her for 10 years. She has been able to cure my son of severe childhood migraines (we thought he had a brain tumor; his symptoms were very severe). She has been able to alleviate many of my medical problems from asthma to sinusitis to herniated discs. I always feel 100% better when I leave her office. Karen has inspired me to become a healer as well. I will never leave New York as long as she is here.